A Growth Factor Heals The Damage To A Preemie's Brain — In Mice : Shots - Health News Scientists have shown that damage to the brain's "white matter" is responsible for many of the developmental problems that very premature infants often face. Now researchers have also demonstrated that it's possible to prevent that sort of damage in mice. 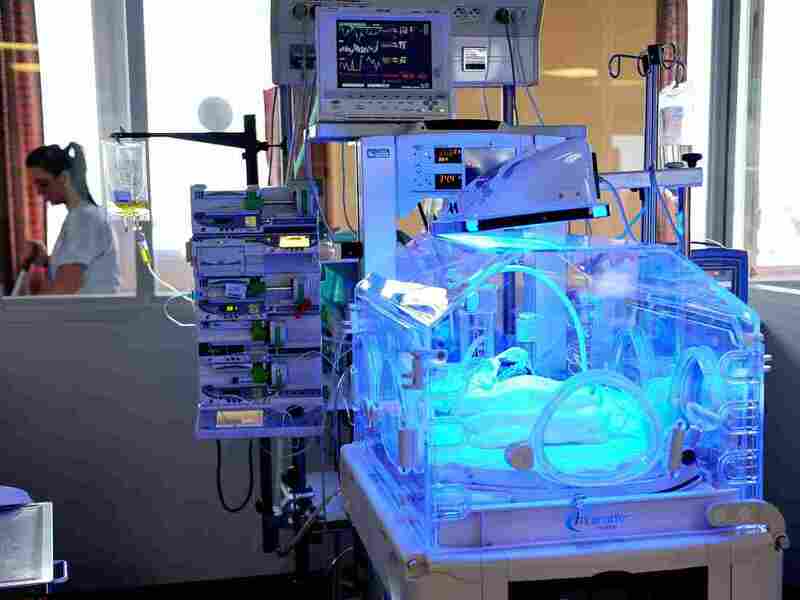 A baby born too soon continues to develop and grow inside an incubator at the neonatal ward of the Centre Hospitalier de Lens in Lens, northern France. A naturally occurring substance called epidermal growth factor appears to reverse a type of brain damage that's common in very premature infants. It was really amazing. These mice looked identical to the mice that were not exposed to the injury. Repeated doses of EGF led to the complete repair of brain injuries in baby mice that didn't get enough oxygen after birth, researchers reported in the journal Nature. "It was really amazing," says Vittorio Gallo, of Children's National Health System in Washington, D.C. "These mice looked identical to the mice that were not exposed to the injury." The result is important because each year, tens of thousands of premature babies sustain brain injuries caused by a lack of oxygen, says Joseph Scafidi, a neurologist at Children's and an author of the Nature paper. "Many of the children that I have in my clinic have either cerebral palsy or they have issues with motor skills as a result of what's known as perinatal hypoxia," he says. This lack of oxygen near the time of birth occurs because children born before the 32nd week of pregnancy tend to have immature lungs and blood cells that are not yet able to deliver enough oxygen to the brain, Scafidi says. So even when they get supplemental oxygen in a neonatal intensive care unit, he says, some brain cells may die. Previous research had shown that oxygen deprivation often kills specific brain cells called oligodendrocytes. These cells form myelin — the insulation that is wrapped around nerve fibers, Gallo says. "Without myelin, nerve cells do not communicate properly." Experiments in mice showed that the damaged brain of a newborn mouse actually tries to replace dead or damaged oligodendrocytes, Gallo says. "The problem," he adds, "is that this happens too late." The researchers thought EGF might start the process sooner, and it did. But the treatment worked only when it was given soon after the injury occurred. That suggests that premature human infants would probably have to be treated within a few weeks of birth, Gallo says. The EGF was given to mice through the nose — which means it would be easy to administer to a human infant. But use in babies is probably still a long way off, Gallo says, in part because many growth factors are known to encourage the growth of tumors as well as new cells. So EGF and other growth factors with the potential to repair brain damage may be tried first in adults with multiple sclerosis, a condition that's also caused by a lack of myelin, says Regina Armstrong, of the Uniformed Services University of the Health Sciences in Bethesda. And it's possible, she says, that researchers will find a growth factor treatment that works against both MS and the sort of brain damage found in very premature infants.